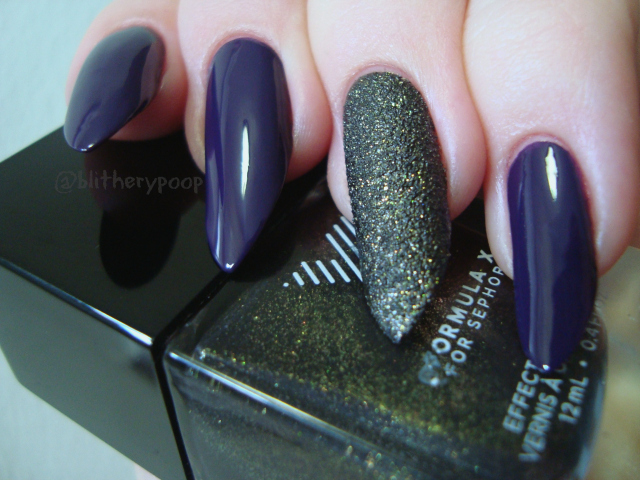 Deep End is a dark purple cream. Almost too shiny for its own good, isn't it? You can see my front door in the reflections. I don't own many Triple Shine shades, but I'm always impressed by the shine when I wear one. The color's gorgeous, reminiscent of OPI Vant To Bite My Neck, but a bit lighter. The formula is great! For a lot of people it could probably be a one-coater, but I used two. There's been some speculation that Triple Shine is being discontinued. A lot of Walgreens locations have every core Triple Shine on clearance, but they still seem to be full-price at CVS, Rite Aid, etc. Time will tell, but I'd be surprised if Sally Hansen is retiring another line so soon after Diamond Shine. They just added new shades, including Deep End, earlier this year. On the other hand, they haven't done any LE's in this line since...what...last summer? Time will tell, but it would be a shame to see two lines go in the same year. On Nouveau Cheap's blog with the CVS Master Clearance List, they had a bunch of Triple Shine polishes on clearance. So maybe they are being discontinued? I do have a few that I like but sometimes I just couldn't justify the price. I wound up buying a bunch in the CVS clearance. lol Deep End is clearanced too. Wonder if this means a reduced line or new shades. It's 99¢ Sinful Colors Sale Time!